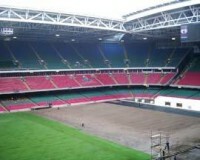 It is way back in March that I last wrote an article about the on goings at the Millennium Stadium. Since that eventful Welsh Grand Slam win on the 19th, the stadium has played host to a great many more games and other non-grass events. It is easy to gloss over the fact that the LDV Cup Final, Konica Rugby Union Cup Final, FA Cup Semi-finals and Final, three divisional Play Off Finals were amongst many other corporate games and minor cup finals played between the end of March and the end of May. June the last of the spring's grass sport in the form of The Legends Tribute rugby match was played. No sooner had the game finished and the posts were removed, that our team of forklift drivers and labourers started to cut the grass into four foot squares, mirroring each individual module underneath and remove the modules. 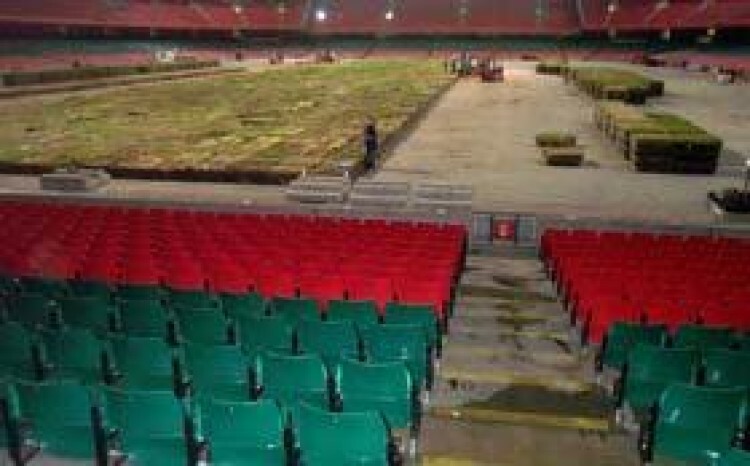 For those of you that aren't aware, the pitch at the Millennium Stadium comprises 7388 high-density plastic modules (or giant plant trays), filled with a drainage layer and growing medium of fibre root zone that rises above the module by approximately 75mm. The module depth is approximately 200mm. The start of this removal operation is always slow, due to the limited space initially available. However once the first few articulated lorries get loaded with modules down in the bus bay, the space in the bowl opens up and everybody starts to work more efficiently. With a reasonable space cleared at the top of the access tunnel, the articulated lorries are then driven straight up into the bowl. For everyone concerned, including me, this was a first, and that evening was the start of a new learning curve. With the Speedway guys moving in the next morning, we had to work diligently and keep the modules moving out. After the game, I had marked out on the centre of the pitch the oval shape that was to be left in, for the speedway track to be built around. We were leaving in just over 3000 modules for another week. Our deadline was midday on the Monday, and just to add to the pressure, there were penalty clauses in place if we weren't finished. The articulated lorries were loaded with anything up to 60 modules at a time, and then transported to a site about six miles from the stadium. The lorries arriving from the stadium were unloaded and the modules stacked three high. The weather was appalling on the night in question, and fortunately the stadium roof was closed, there was no such luxury at the rail terminal and the poor guys on the forklifts were working in atrocious conditions. The tall pylons of floodlighting seemed to be ineffective in the heavy squally rain and the guys found themselves unloading the lorries in a wet gloom by forklift headlights. The Speedway guys arrived at 8am, delighted that they could start the track and wall construction much earlier than anticipated. The following week, after the Speedway was finished, the haulage and forklift guys were back and the remaining modules were removed from the stadium and stacked at Freightliner as well. With the system stacked we decided to have a go at piecing a trial area together and successfully put a 15 x 15 matrix of modules together at the rail terminal. However we had concerns about the integrity of the modules and also made an assessment of each of the modules that we randomly pulled from the stack. 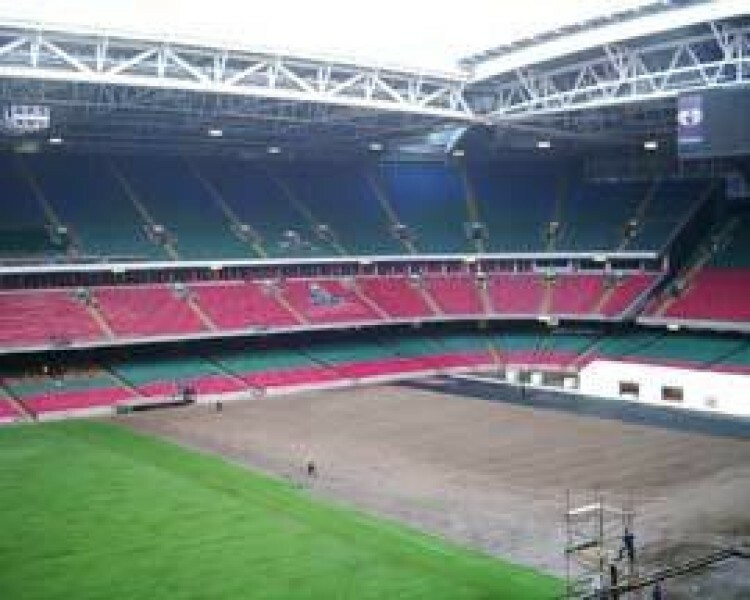 It is important to know that this system was installed into the Millennium Stadium in 1999 and was only the second GreenTech ITM system in use anywhere in the world. The only working example was at the Giants Stadium in New York, where two modular systems were in rotation. 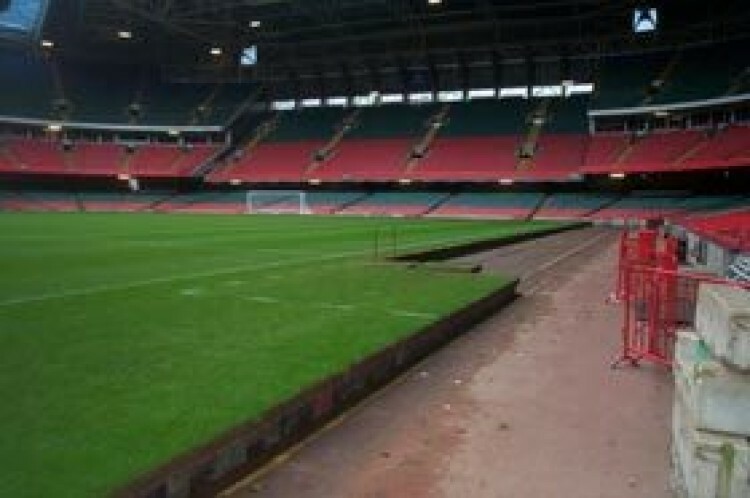 The Millennium system has therefore been in operation for about seven years, regularly moved in and out of the stadium. Each module has been lifted, stacked, transported, re-laid a fair number of times and many of the modules are starting to look tired and ready for replacement. The stadium hosted two concerts, REM and U2 after the speedway, and then the Watchtower convention moved in for three days of worship. As soon as their equipment was removed on the 20th July, we were back into the stadium to start the major operation of importing and piecing together over 4000 tons of modules and material. I had organised a surveying team to come into the stadium the week before and they had set out the 'bowl' from scratch, working with original drawings of the pitch. On the Tuesday that we started, one of the surveyors helped us to place the first line of modules in correctly. This first row, as we now realised, had to be absolutely exact. On the first shift we took 10 hours to place about 280 modules. The night shift took over from us at 6pm, ably supervised by Lee Evans (Head Groundsman) and through the night they laid another 770. There were also three lorries working around the clock bringing in the modules from the rail terminal and an extra forklift driver there to load the lorries with the drivers. On the Wednesday shifts nearly 2700 modules were placed, but we started to encounter problems of square ness again, and had to pull a few rows out and straighten the foot locator pads. 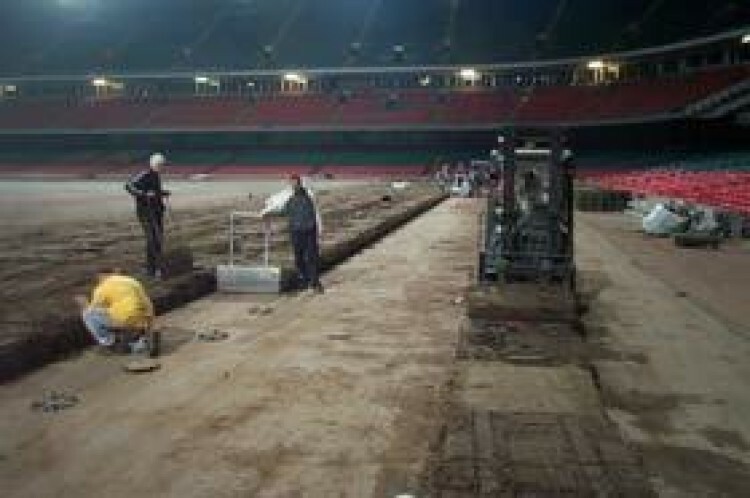 By the Friday all the modules were in and we laid the concrete step blocks around the perimeter of the pitch. Given that this was our first attempt at piecing the pitch back together in the stadium, working to deadlines once again, I was extremely proud of the way the 45 or so staff had performed on the eight twelve hour shifts. I had allowed a gap of two days between us finishing and SF Hodgkinson coming in to prepare the surface prior to turfing, this was in case of unseen problems- in the end we didn't need this luxury. 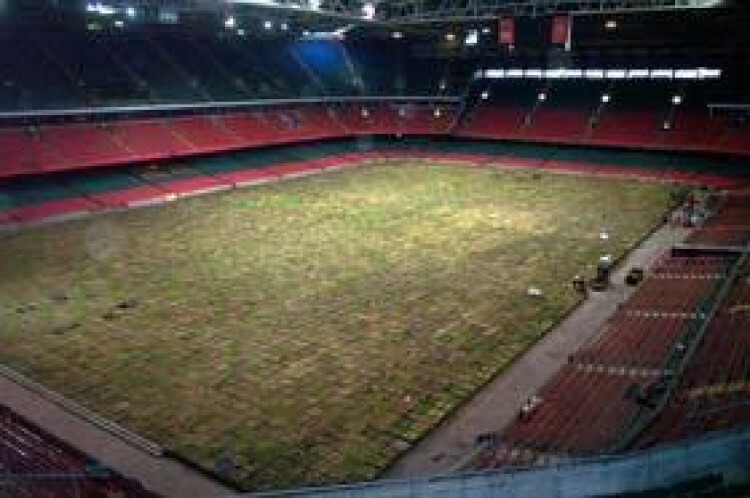 The dead vegetation that still sat on top of the modules was Koro'd off and removed (thank God-the smell permeated every edifice within the stadium), and then the fibre rootzone was tickled up with a four metre stone rake. Over two days SF Hodgkinson's contractor Derek Crane achieved excellent levels and the surface was now prepared for the turf. I had no reason not to retain the Dutch company, Hendriks, for the supply and installation of the pitch. 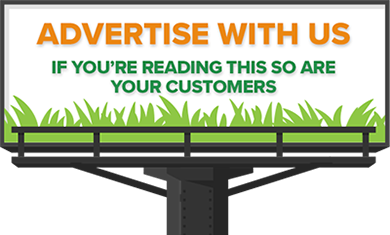 Their workmanship and quality of the turf delivered to date had been exceptional. 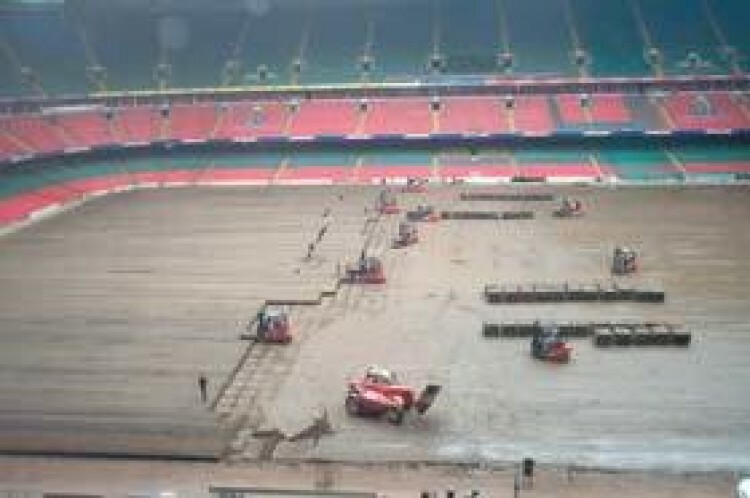 Due to the nature of fixtures and events at the Millennium Stadium, this new pitch was only going to be in for three major games, the Charity Shield, the Powergen Rugby League Cup Final and the Wales v England World Cup Qualifier (WCQ) on the 3rd September. It didn't seem that the surface had been in more than five minutes before we started to strip it out again on the evening of the 3rd September. England had just won a less than memorable game and as the stadium cleared of supporters, we removed the goals, while other guys de-rigged cameras/cables and advertising hoardings. 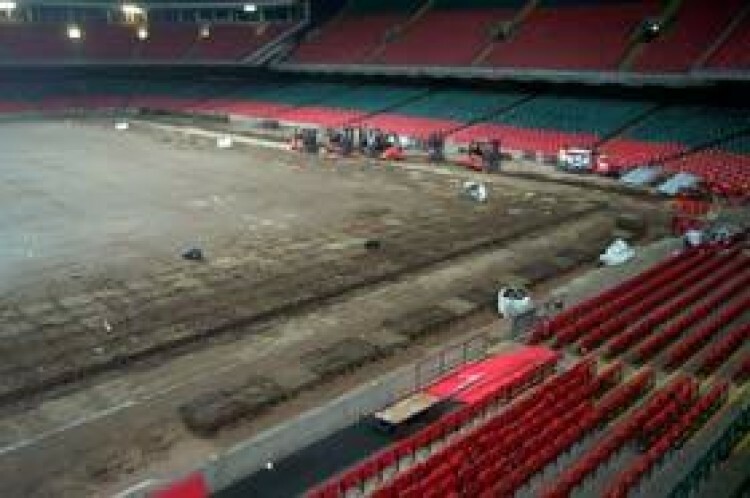 I had decided to strip off the turf with the Koro (a crying shame), before removing the modules. This was for a number of reasons. One, we didn't have a layer of stinking vegetation sitting on the modules when they came back; secondly the next move back in was again against the clock, and we would be struggling with time to complete all operations, so removing the turf in advance saved us time a few weeks later; and thirdly, the cost saving of not having to pay a lot of extra labourers to cut around each of the 7388 modules. I stayed with them through the night, catching a couple of hours sleep on a sofa. At 8am the haulier (eight lorries) and the forklift drivers arrived, and immediately found it easier to pick up and stack the turf stripped modules. The team worked efficiently through the day and by 11pm the site was clear of modules and concrete edge blocks. 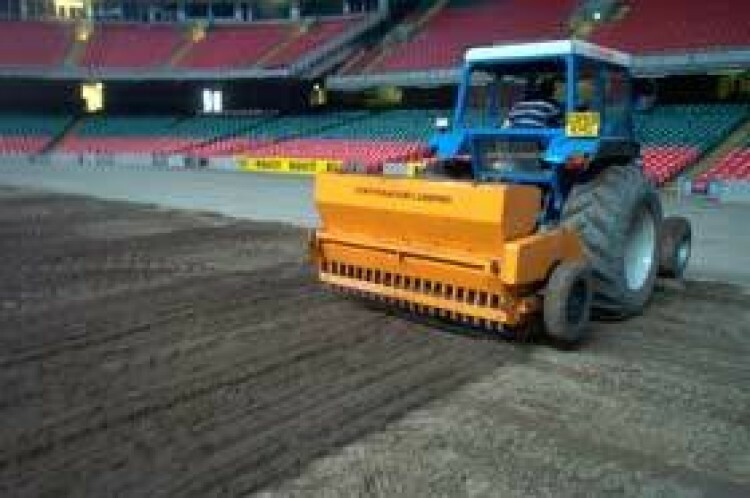 The stadium tarmac was again, cleared of spoil, and swept spotless with road sweepers. The next events due in were a concert for Gay Pride and the GB Rally. We also had a banquet dinner on the 4th October and it was this dinner that was causing us the biggest dilemma. The Wales v Azerbaijan WCQ was on the 12th October and training for both teams would have to be catered for, potentially on the 10th and 11th. There was also a Barnardo's Half and Full Marathon in the event schedule on Sunday 9th. This involved 7500 people running down into the stadium and around the pitch through the day. The banquet event was an evening affair and so the catering tents, staging, lighting towers, flooring, carpets, tables and chairs had to be removed afterwards, all completely gone by midday on the 5th. Effectively this gave us three and a half days to piece together half the modular system, grade the surface and turf it, to my mind a virtual impossibility. Long in advance, I'd liased with the commercial department and event organisers and we reached a happy compromise. This agreement meant that we could import four fifths of the modules in advance, and turf just under half the surface prior to the banquet. With everybody organised, we started re-instating the modules for the second time this year on the 22nd September, just 18 days after it had been removed. I have tried to retain the same lads on each move, allowing them all to gain the knowledge and experience of piecing the modules together successfully. From the forklift and lorry drivers to the teams laying in the modules, everyone now works competently. 12-hour shifts aren't the best at any time, but there is some great camaraderie now, even between the day and night shifts. 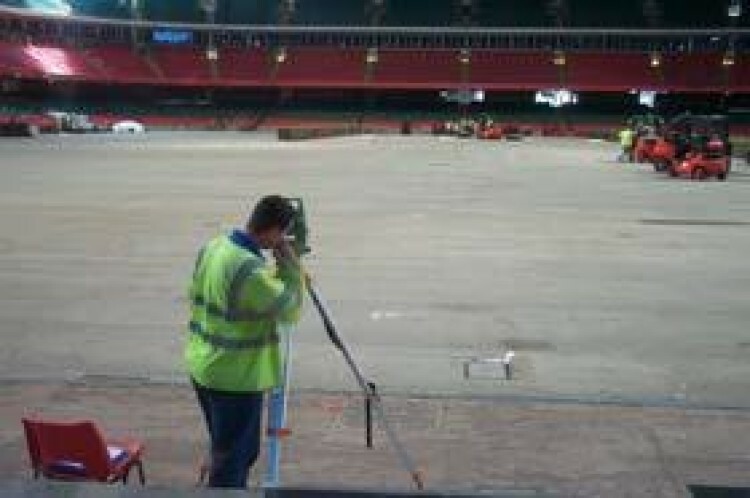 When we were finished, SF Hodgkinson graded the laid area and Hendriks laid just over 4500 square metres of turf. The turf this time is a mix of tall fescue and smooth stalk meadow grass. We have chosen this mixture because the pitch has to withstand a fairly hefty fixture list of four rugby internationals and at least ten training sessions in November. Lee Evans had flown over to Holland to view the turf, and was extremely pleased with its quality. He even brought some back, though I doubt if he's the first to bring grass back through customs from Amsterdam! 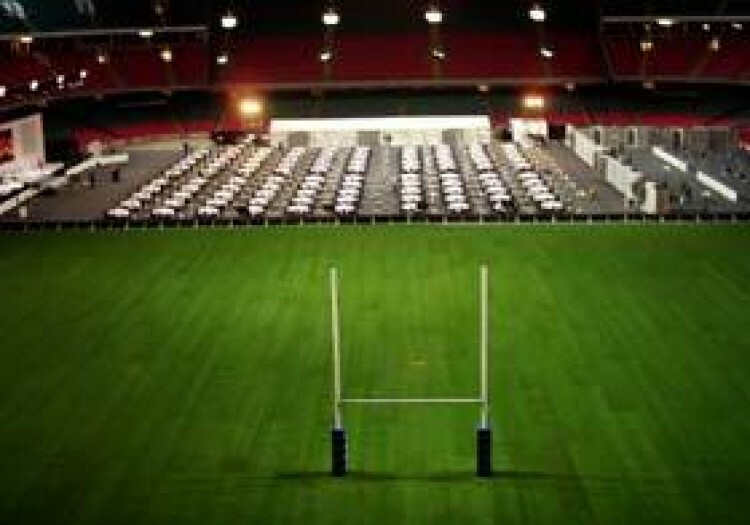 The turfing was down with a few days to spare before the banquet organisers started their event build. On Wednesday 5th October, I arrived at the stadium at 7am, to find that virtually none of the banquet event had been de-rigged, (just what you need when you have just a few days to get the pitch ready for a World Cup Qualifier. There were two lorries loaded and on the way over from the storage site and about twenty men turning up at 8am to get started. Although the original de-rig was supposed to be completed by noon, the event organiser had subsequently told me that apart from flooring everything else would be gone through the night. Anyway problems are there to be solved and we set the lads on various tasks to help the event organisers get their equipment out of the stadium. 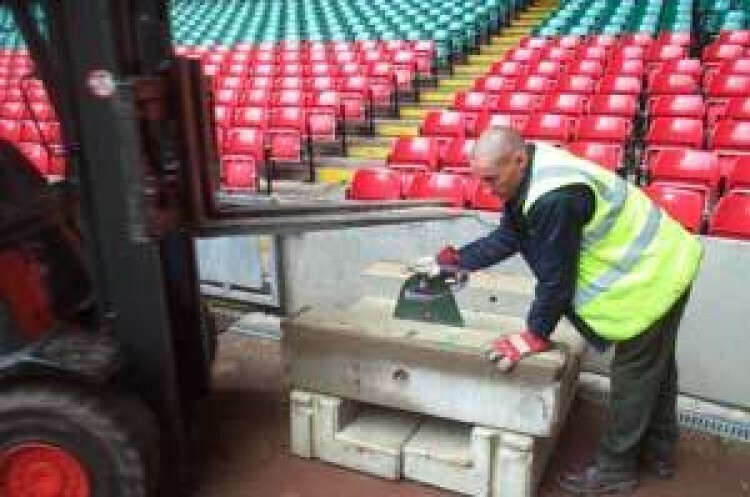 The first concrete blocks were removed at 13:30 and the last event lorry was clear of the stadium for 15:30. By the time the day shift were changing over to the night shift only 300 modules had been laid. The nightshift worked tirelessly and by 06:00 Thursday there were about 40 modules and about 60 blocks left to place in. Derek Crane arrived on behalf of SF Hodgkinson to do the final surface grading at 07:00. Although we were finishing the corner area off, we brought up some steel ramps and helped Derek to get the tractor and stone rake up on to the modules. He started to grade while we finished the corner area. 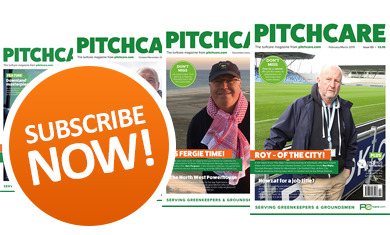 At 11:45 Friday morning the last turf was cut in at the edge of the pitch and now Lee and Steve had the unenviable task of getting the newly laid turf ship shape for the following weeks game. Lee managed to move the Wales training session to Tuesday morning, with Azerbaijan training the same evening. The game itself went well, Ryan Giggs scoring two cracking goals. The turf lines still showed on the cameras on the North end, but the turf laid the week before had married in nicely. The next events started at the end of October with some corporate football matches; these were followed by four consecutive Saturdays of international rugby. Each of these games proceeded with a training session for each team, and the Welsh squad indulged in some extra training sessions as well. From the training sessions prior to the Azerbaijan game to the time we took the modules back out on the 26th November, the pitch had a further 22 uses in terms of training and games. 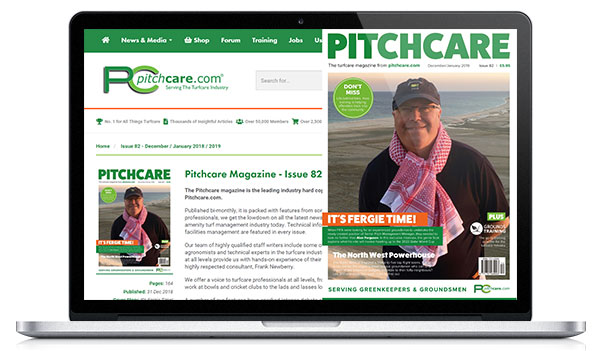 Add to that some filming, photo shoots and corporate entertainment, we were delighted with the way the pitch stood up to this intense period. Yes, the surface lost grass, but the pitch never lost stability and the players, even during the final game with Australia, still had the confidence to scrum to the line. When you consider that there were nearly as many uses on the pitch in just over six weeks than some Premier clubs will have in a season, the turf (that has been used) has passed with flying colours. Given the nature and scale of events at the Millennium Stadium, it is quite hard to envisage another suitable operating system. The modular system has major benefits, in allowing virtually any event to be hosted at the venue. When you think that this year alone, there will have been 4 sell out concerts, three different motor sports as well as a full programme of football and rugby to name but a few events in the annual calendar. It has been a tremendous year, and I would like to personally thank the haulier Mark Rees, Ace Site Services (forklift drivers), Linde Severnside (forklifts) as well as Lee, Steve (Assistant Groundsman) and all the staff, who have given up their time to help on the pitch moves. We are now looking at the gradual replacement of old modules, so that the system can be revitalised.